We want to show pictures of aquatic animals that live on or near the Marsh & will bring them to you when these are available. If you would like to share your Marsh photos send them in we'd love to see them . Up to five centimetres long. Three spines on dorsal surface. Lateral bony plates. In breeding season male develops red throat and belly and female becomes silvery. Freshwater, brackish water. Often intertidal. In Purewell stream, drainage channels and creeks. Complex. Male selects territory and prepares a tunnel shaped nest. Female led to nest where eggs are laid and fertilised. Male guards and fans nest to aerate. 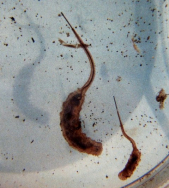 Young disperse when about two weeks old. Worms, crustaceans, insect larvae and small fish. Slender. Body tapers to tail. 9 or 10 dorsal spines. No true scales but bony plates near rear. Olive green to brown. Male develops black areas in breeding season. Identification: Elongated, cylindrical body. Small gill openings. No pelvic fins. Minute embedded scales. Habitat: Depending on stage of development sea and freshwater. Seen on Marsh: Creeks,salt pans and reed beds. Breeding: Complex. Adults spawn in the Sargasso Sea. Larvae (leptocephali) carried by ocean currents to Europe. Gradually develop into transparent ‘glass eels’, which eventually develop a black colouration and become elvers. These enter estuaries and migrate upstream. May spend up to 20 years here before returning to Sargasso Sea to breed. While carrying out some brief surveys of the salt pans on the Marsh and Purewell Stream recently, we were pleased to find some elvers [young eels]; a fairly unusual sight these days! Current reports from the Environment Agency suggest that the number of European eels [Anguilla Anguilla] across the continent has declined about 95% in the last twenty five years and continues to do so. Nearer home our local historian, Mike Andrews, tells me that forty years ago eels abounded in fishing nets and could also be clearly seen in the water. Now they are a rarity. The question of where have all the eels gone is being asked very seriously by conservationist and fishermen alike. So what is the problem? What has caused the considerable decline in numbers? No one really knows the answer although there are many suggestions. The possibilities include shifting of the Gulf Stream so that the young eels are swept away from our shores, illegal fishing methods, parasitic infections, absorption of toxins and the blocking of rivers by weirs and dams. Another entirely different suggestion is that there was a huge eel population explosion some fifty or sixty years ago, as happens from time to time in the animal kingdom, and that numbers are now returning to normal. Many proposals have been put forward to try and reverse the decline in numbers including a ban on exporting eels out of Europe, a limit on the fishing season and the number of licences granted, the building of fish passes and catching the elvers to release them again further upstream ahead of any barriers. The Environment Agency is keeping a close eye on the situation. Invertebrates do not have a backbone. 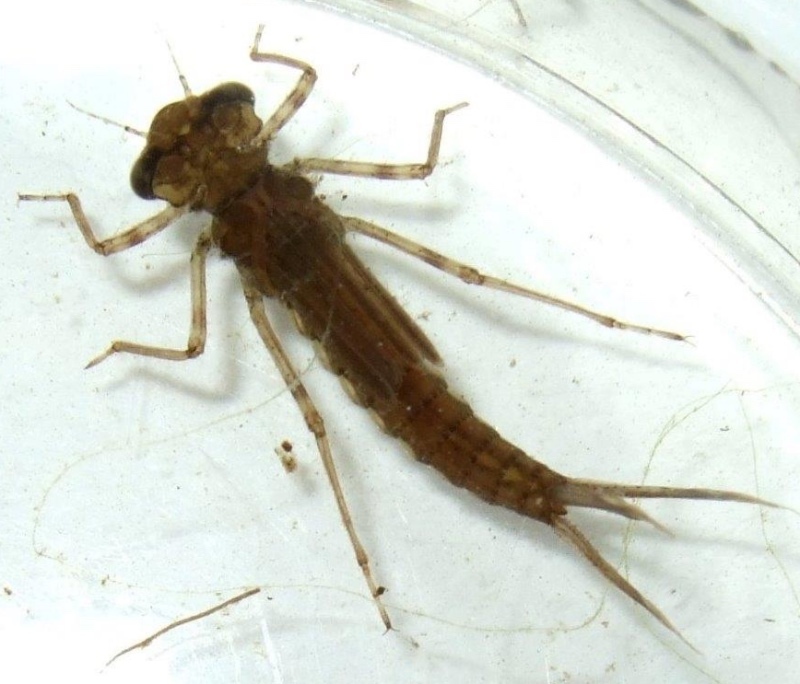 Aquatic invertbrates live in or on the water or are dependant upon it for part of their life cycle. According to their complexity of structure, the invertebrates are divided into many groups. 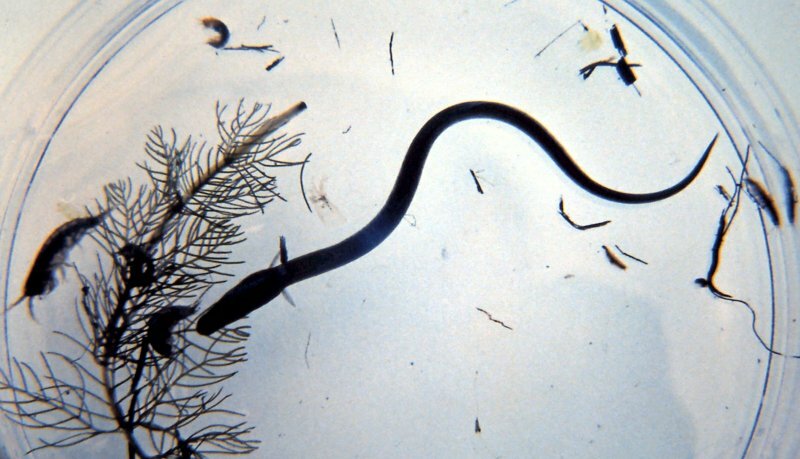 Those listed below begin with the most complex such as the molluscs (pond snails, mud snails, bivalves) through the insects (dragon flies, pond skaters, mosquitoes), crustaceans (shrimps, crabs, water lice) and annelids (ragworms, leeches, lugworms) to the relatively simple flatworms (planarians). Within their group, the animals are listed alphabetically, by their English name or by their Latin name if this is the only one available. About 5mm tall. Pale greyish brown. May occur in large numbers. Running or trickling water. Mud. Freshwater or brackish. May emerge from water. Purewell stream, drainage channels, Central Marsh, Grimmery Marsh. Eggs develop without fertilisation (parthenogenesis). Young protected within shell and emerge fully developed. There are two other species of Hydrobia in the Marsh, Hydrobia ulvae and Hydrobia ventusa. These are found in brackish water only. They are very similar to H. jenkinsi and require a microscope to differentiate between them. They live in mud flats and estuaries. All species are enjoyed by Shelduck who often consume vast quantities. Black, brownish shell with fine striations. 8 to 12 mm. Flat, non retractable tentacles with eyes at base. Common. Semi-aquatic In freshwater, ditches, wet meadows. 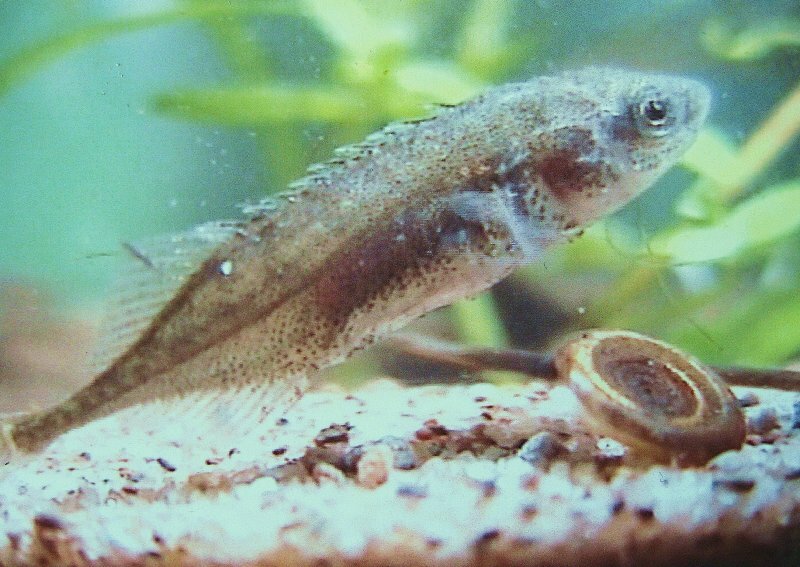 Hermaphrodite (single individual acts as male and female) but usually cross fertilisation. Lays eggs in clusters in jelly stuck to plant or stone. Young develop and emerge. Dead and decaying vegetation. Algae. 15 to 30mm long. Slender with three projections at end of body which serve as gills. Three pairs of legs. Two large eyes. A pair of antennae. Amongst weeds in slow flowing or still water. Purewell stream. Central and Grimmery marsh drainage channels and pans. 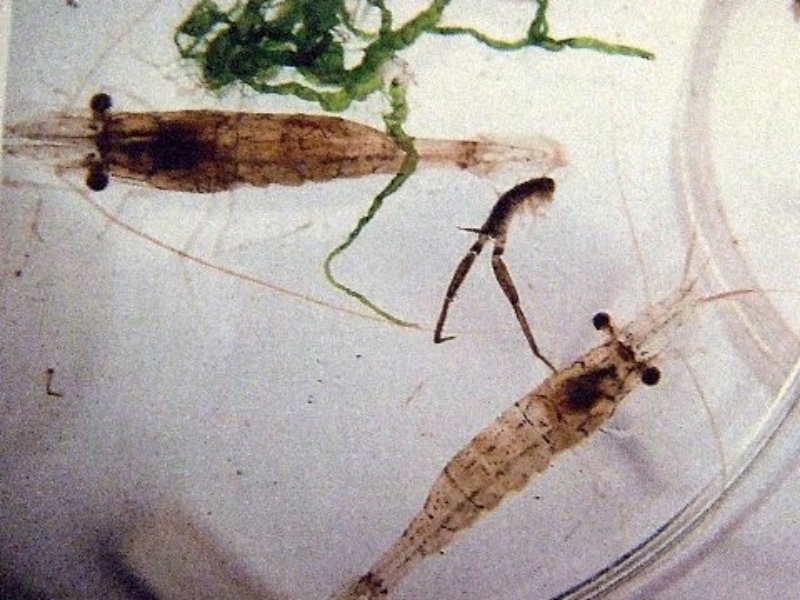 The free flying adults lay their eggs on or in water plants at water level or just below. 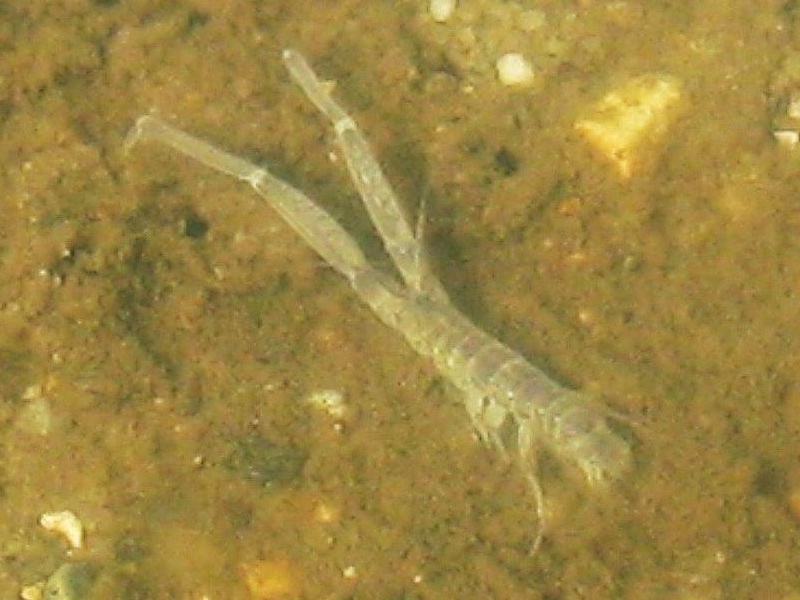 Small damselfly nymphs emerge and remain in the water for one to three years, growing and moulting up to 12 times. Eventually, the nymph climbs up the stem of a plant and the skin splits down the back to release the adult. Carnivorous. Captures prey with help of a hinged mask ending in a pair of strong pincers. The identification of these nymphs is not easy and requires detailed microscopic examination. Develops from eggs laid in water. Hangs from water surface at an angle. Length about 10mm. Swims jerkily. Pools on North Scrubs, Grimmery, East and North Marsh, Mother Siller’s channel and drainage channels. Larval stage lasts about 2 weeks. Moults four times and then develops into pupa. 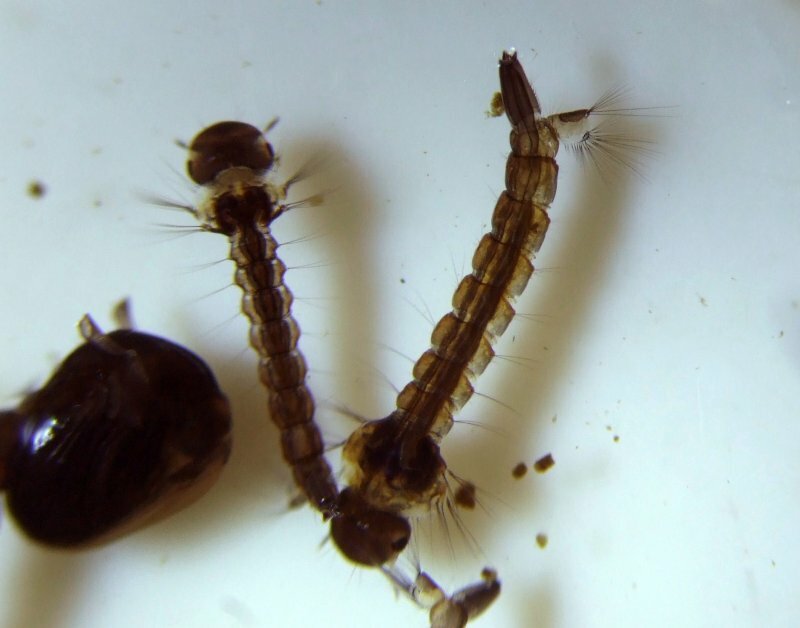 After two days skin splits and adult mosquito emerges. Larval stage of a hover fly (drone fly). Whitish grey. Body grub like, about 2cm long or more. Six pairs of small false legs on abdomen. Long, telescopic breathing tube which reaches to the surface and can be extended to 6cm. Breathes air. 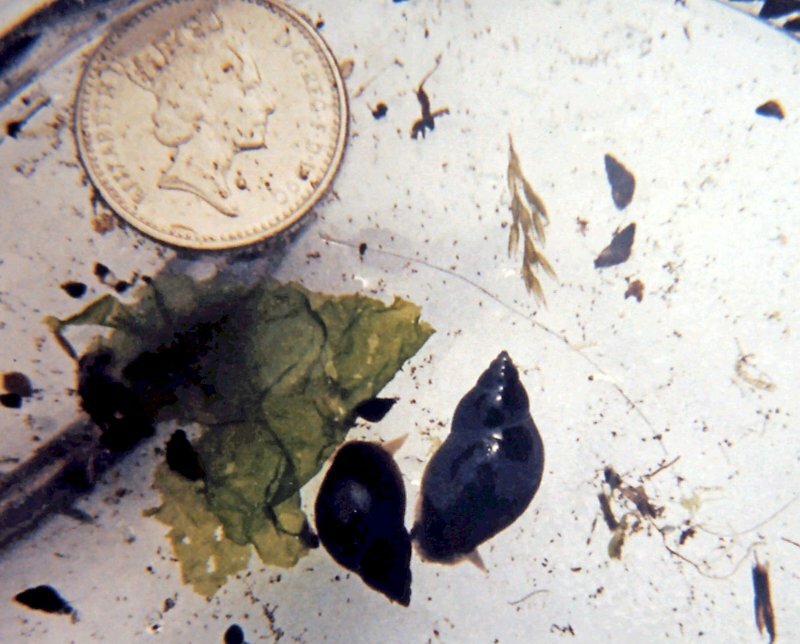 The larva pupates in either in water or on moist ground and eventually the adult drone fly emerges. 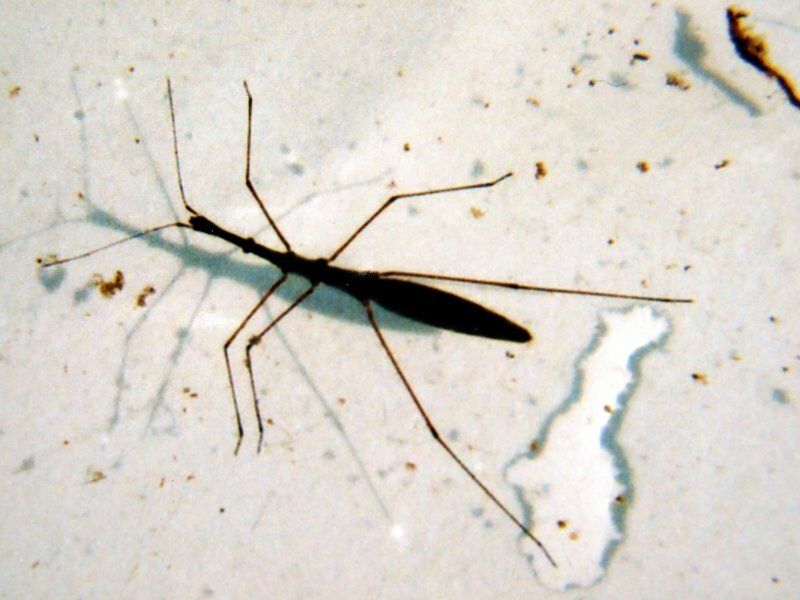 Slender, blackish insect. Usually wingless. Head and body very elongated. Up to 13mm long. On surface of still, slow flowing or stagnant water. Scavenges on dead insects, water fleas, mosquito larvae caught in surface film. Examines prey with antennae and pierces it with rostrum. Also active predator. Brownish with small flecks. About 3 to 5cm long. Carapace extends between eyes in short spine. Muddy and sandy estuaries and lagoons. Mid shore. Salt pans and creeks. Burrows in sand. April to September. 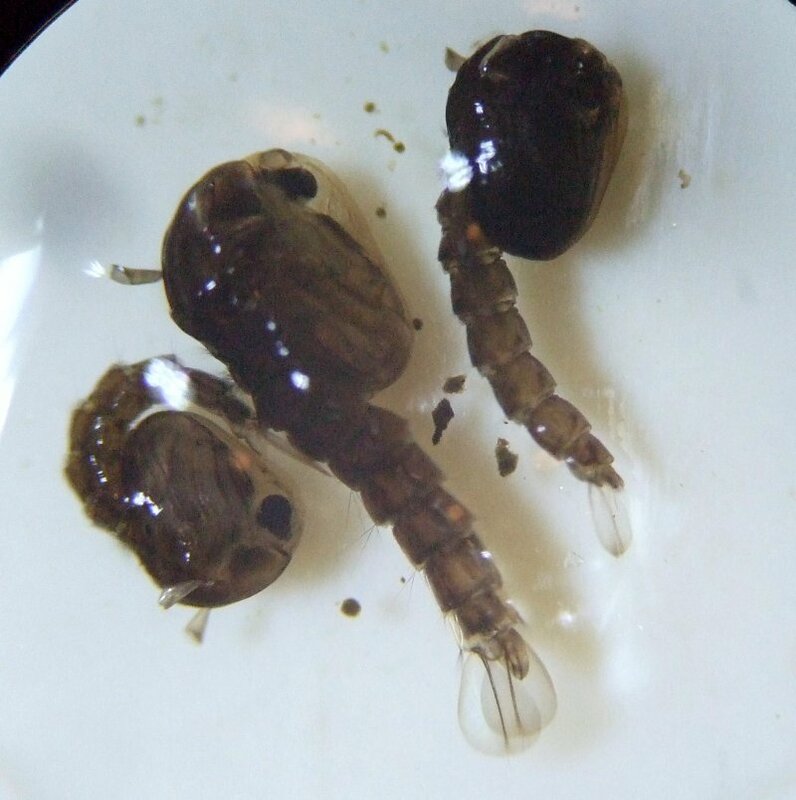 Eggs carried by female glued to abdominal appendages (berried female). Larvae live in plankton for about five weeks. 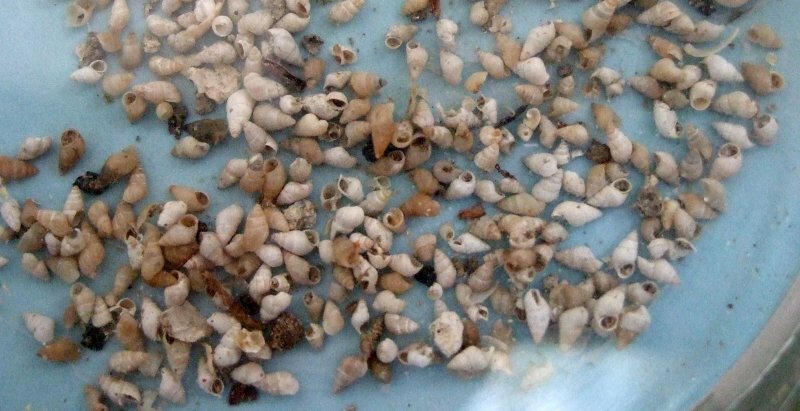 Wide variety of plant and animal material such as worms, crustaceans and molluscs. 8 to10mm long. Two pairs of antennae the second of which are very long and stout. Whitish, grey in colour. Can swim, crawl, walk and burrow. Lives in semi-permanent burrows in mud. Can withstand a wide range of salinities. Widespread on salt marshes. In salt pans and creeks. Usually two broods a year. Young protected in brood pouch of female. Emerge as young adults. No larvae. Feeds on micro-organisms including diatoms which it collects by scooping movements of its long antennae or by filtering off particles from a respiratory current drawn into the burrow. Can be green, brown, orange or red. About 3 inches wide and 2 inches long. Carapace has 5 short teeth along rim and 3 rounded lobes between the two eyes. Four pairs of legs and a pair of strong pincers. Can tolerate a wide range of salinities so has a wide range of marine and estuarine habitats. Migrates into deeper water in winter. Also migrates with tides. Widespread. In creeks and salt pans. Male mates with recently moulted female. 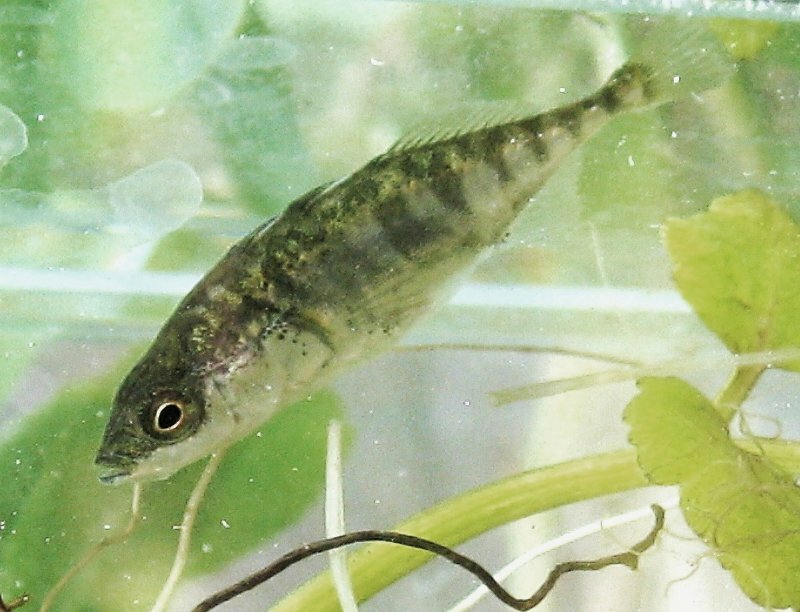 Female carries eggs in pouch under abdomen and moves into deeper water. Larvae develop off shore and go through various stages reaching maturity in about three years. 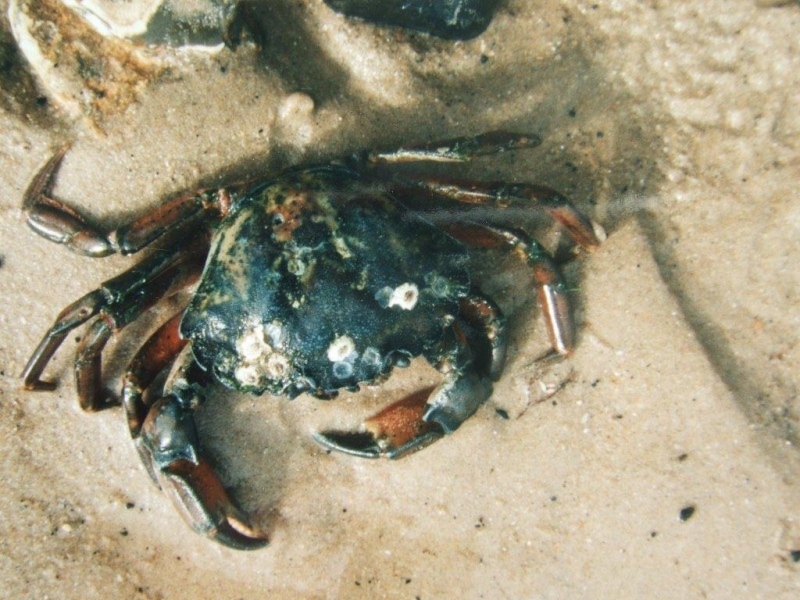 Juvenile crabs return to intertidal regions. Omnivorous, picking over sediment. Worms, small crustaceans and molluscs opening the latter with their pincers. 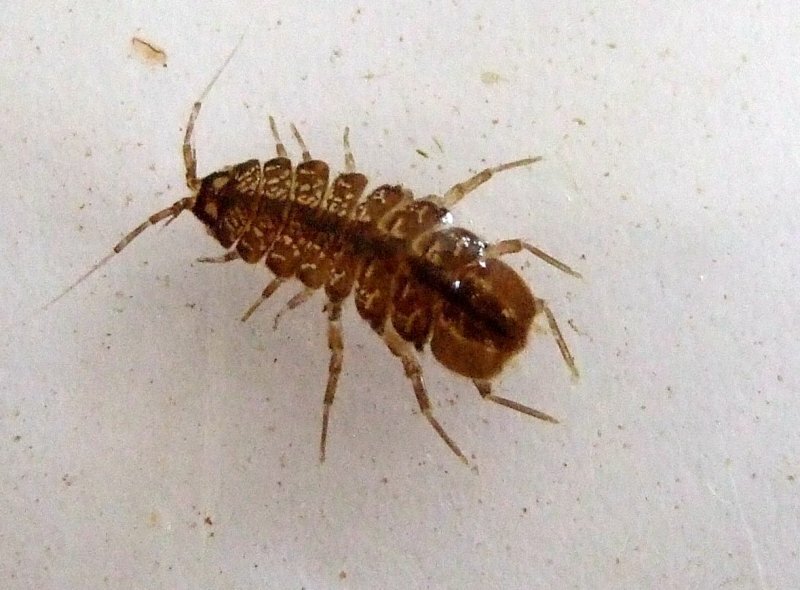 Crawls on debris or amongst plants in flowing or still water. Can tolerate some pollution. Pools behind the Pod. Purewell stream. Drainage channels. 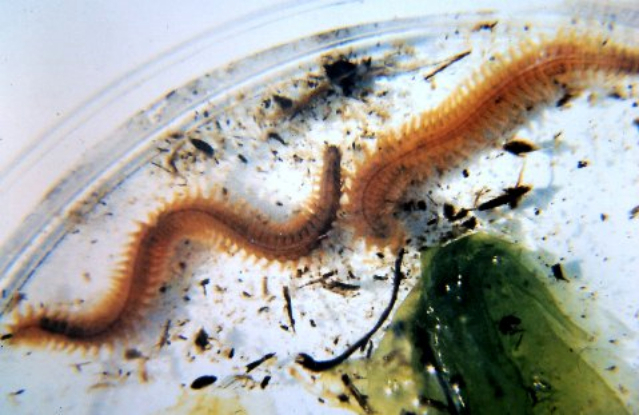 Segmented worm with swimming legs (parapodia) covered with bristles. Head has reversible proboscis with two large jaws. Colour reddish brown or green. Marine and brackish water. Constructs burrows in mud. Also free swimming. Female releases eggs in burrow. Male releases sperm near entrance. After fertilisation larvae develop, leave burrow and eventually turn into adults. Almost anything! Scavengers, predators, and trap phytoplankton in mucous funnel net formed at entrance to burrow.